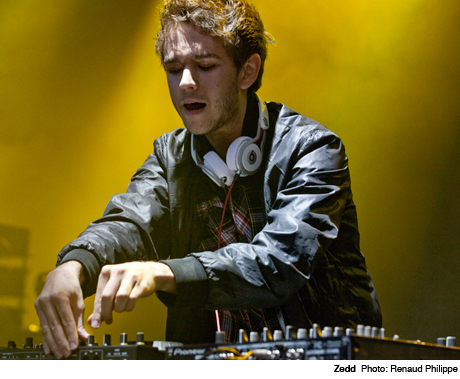 German DJ/producer wunderkind Zedd is being hailed as the next Skrillex, which is a little misleading judging by his recent set in Quebec City. Although Zedd is definitely teeming with skills, his flow is just one dubstep buildup tease after another, a constant, ever-flowing climax with epic breakdowns for a minute or so each, before moving onto the next ebb and flow. You have to give Zedd credit, though, he looked amazing up there and had a blast doing it. Often bringing the crowd into a Top 40-infused frenzy with his choice of popular remixes and samples, Zedd was like the Justin Timberlake of dubstep. And, really, you could argue there's nothing wrong with that. Zedd also had the good fortune of the sun going beautifully down behind the stage near the end of his set, while he turned his finale into some sort of dubstep-ified circus music blowout.